View of Church Street looking east from Second Street. 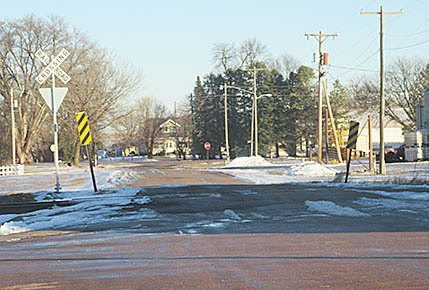 Albion City Council tackled its longest agenda in some time on Tuesday night, Feb. 14, with a total of seven public hearings and four ordinances under consideration. The council held a public hearing on the city’s one and six-year street plan, adopted the plan, and accepted a bid from Gehring Concrete and Construction of Columbus for reconstruction of East Church Street from just west of the railroad tracks to the Highway 91 intersection. Gehring Construction bid $282,368 on the project, which was under the engineer’s preliminary estimate of $314,000. The Gehring bid was also well under the three other competitive bids reviewed Tuesday night. The poject is part of the city’s one-year street plan. Work is expected to start by May 1, 2017.